I sighed and slumped lower in my kitchen chair, horribly regretting my decision to tell Ida Belle and Gertie about my dinner date that night with Carter. The two of them had descended on me shortly after breakfast, certain that I needed help presenting myself as a normal girl. It’s not that I disagreed with them. I just didn’t think they were going to offer much of an improvement to the process. Now I sat captive in my own kitchen with pink polish on my toenails and wearing some oily lotion stuff on my face that Ida Belle said was hydrating my skin and had to sit until it dried. It was all I could do not to lift the tablecloth and wipe my entire face with it from scalp to neck. “Sorry,” Gertie said, “but this wax is taking forever to heat.” She poked a wooden spoon into a pot of yellow sticky stuff and frowned. “Is a couple of hairs above my lip really worthy of this much effort?” I asked. “Yes,” they both replied at once. “I could do it,” Gertie offered. “No!” Ida Belle and I both responded. Despite constant nagging, Gertie hadn’t had her glasses updated in years. If she got a hold of me with tweezers, I was as likely to end up missing a lip as the hair. “Well, you don’t have to yell about it,” Gertie said. I stared out the kitchen window at the perfectly beautiful Louisiana day. The sun was shining, and a cool breeze blew across the bayou, gently rocking my hammock. My recently acquired roommate, a black cat named Merlin, was taking full advantage of the weather, stretched out in a patch of sunlight near the azalea bushes. After sharing space with Merlin, I’d decided that if I believed in reincarnation, I’d want to come back as a cat. Cats were surly and not required to participate in anything, but managed to convince humans to provide everything they needed. It was the perfect existence for someone like me, who found everyone and everything as suspicious as cats did. “Sarcasm is neither warranted nor appreciated,” Ida Belle said. I barely managed to hold in a laugh at Ida Belle’s dismayed expression. Served her right for putting me through this, and all over eating food. It seemed like an awful lot of effort for a meal, and given that I’d once crawled two miles in the sand in hundred-degree heat to eat a cactus, that was saying something. Ida Belle stalked out of the kitchen. I jumped up from my chair as Gertie shot her a dirty look. I hoped my hasty departure didn’t make it appear as if I were taking sides, but if the choice was looking at clothes versus having scalding wax applied to my face, looking at clothes was going to win every time. With any luck, that wax would remain a cold, hard lump and those five hairs, or whatever, would go on to live healthy and prosperous lives. When I’d first arrived in Sinful, Ida Belle and Gertie had roped me into their search for a missing friend. 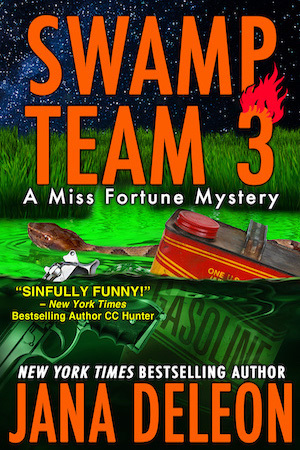 The search extended to an island in the swamp the locals appropriately called Number Two. The entire place smelled worse than a sewer. Ida Belle had pointed out that if Ahmad, the arms dealer who had a price on my head, ever tracked me to Sinful, Number Two would be the perfect hiding spot. I’d already decided that even if the hounds of hell were chasing me, I wasn’t going within a mile of that island again. Ever. I looked at myself in the mirror on the inside of the closet door. I’d never seen myself as attractive. Deadly, certainly. But attractive was a label I assigned to other women. Mostly women who didn’t kill people for a living. Female assassins were few and tended to be a fairly tough bunch. “You don’t see it, do you?” Ida Belle asked. I glanced once more at my reflection and blew out a breath. I understood the point Ida Belle was trying to make, and I’d be lying if I didn’t admit that I’d been surprised by my own reflection more than once since I’d arrived in Sinful. With the long blond extensions, street clothes, and a dash of lip gloss, I looked a lot like my mom—the way I remembered her. But it wasn’t something I was ready to dwell on. Thoughts of my mother always led to thoughts of my father, and nothing beautiful lay in that path. “Yeah, I guess they do,” I said finally, hoping Ida Belle would let the whole thing drop. She gave me a satisfied nod and turned back to face the clothes. “He said casual, right? I think the blue sundress is perfect for a casual summer dinner, and it goes well with your eyes.” She reached for the sundress. I froze for a moment as Gertie’s voice resounded throughout the house, then bolted out of the bedroom and down the stairs, Ida Belle on my heels. The scene in the kitchen was confusing and frightening. A skillet on the back burner of the stove, containing the remnants of bacon grease from my breakfast, had flames shooting up a good six inches from the bottom. Gertie, who was clearly panicked, was flipping the dials on the stove, as if that was somehow going to extinguish the fire. Gertie grabbed a dishrag as I leaped across the kitchen to the back door. I flung the door open and launched to the side as Gertie hurtled toward me with the pot of wax. “Not the wax!” I screamed, but it was too late to stop forward progress. Gertie had already revved up her fastball and hurled the entire pot of wax when she was halfway across the kitchen. I cringed and I’ll admit it, cowered behind the door, expecting her to miss the opening entirely and splatter the whole mess across the kitchen. But for a change, luck was on my side. The pot went sailing past me and out the door. Ida Belle had managed to find an old bag of flour and was poised to toss the whole mess on the burning pan. As I dashed over to help, I heard someone yell outside. Ida Belle, who was already midway through her toss, flinched. Half the flour fell on the burning skillet. The other half flew directly in my face, where it promptly clung to the oily, undried lotion. I spun around just in time to see Deputy Carter LeBlanc, my dinner date, stomp into my kitchen, hot wax splashed across the center of his T-shirt. I gave a silent prayer of thanks that Gertie’s aim hadn’t been any higher…or lower. “What the hell is going on here?” Carter glared at Gertie and I thought for a moment he was going to start yelling again, but then his vision shifted and he caught sight of me. His eyes widened and his jaw dropped, but not in a good way. Then it occurred to me I probably looked like Casper the Friendly Ghost, which likely wasn’t at all what he had in mind when he’d asked me to dinner. “Gertie started a fire,” I explained. “You don’t know that,” Gertie argued. “I don’t need new glasses.” Gertie stalked outside, I assumed to retrieve the flying wax pot. Carter, who had finally managed to close his mouth, stared at me for several seconds, then his lower lip started to quiver. Finally, he couldn’t hold it in any longer and the grin he’d been fighting against crept out. I slammed the door behind him and locked it for good measure. A second later, the banging started. I sighed. That pretty much summed up my entire stay in Sinful.